This was built from a Downtown Deco kit. The front was modifed to represent a post war 1940s rebuild with replacement roll-up doors. 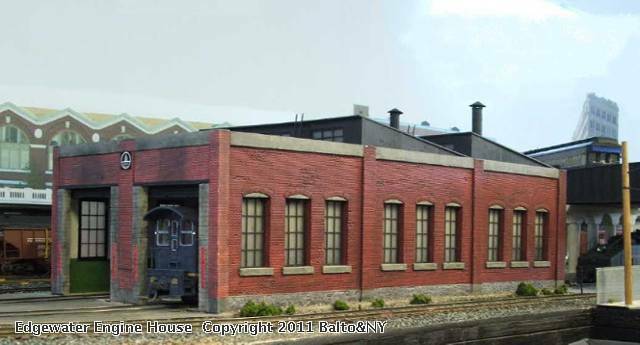 The roof is equipped with two tall smoke jacks to accomodatre steam power. The engine house is built on a 1/8" luan plywood base, with cut-outs for inspection pits and rails fitted in place, as well as strong end of track bumpers. Not good to have a heavy loco accidentally smash through the Hydrocal back wall! Built this way, the engine house with reasonable ease can be removed from the layout if necessary.